Picture - Consolidated B-32-1CF, the first B-32 built after modification to Block 20 standard. The Consolidated B-32 Dominator (Consolidated Model 34) was a heavy bomber made for United States Army Air Forces during World War II, and has the distinction of being the last Allied aircraft to be engaged in combat during World War II. It was developed in parallel with the Boeing B-29 Superfortress as a fallback design should the Superfortress prove unsuccessful. It only reached units in the Pacific during the summer of 1945, and subsequently only saw limited combat operations against Japanese targets before the end of the war. Most of the extant orders of the B-32 were cancelled shortly thereafter and only 118 B-32s of all types were built. The engineering development of the B-29 had been underway since mid-1938 when, in June 1940, the US Army Air Corps requested a similar design from Consolidated Aircraft Company in case of development difficulties with the B-29. The Consolidated Model 33 used to base its proposal was similar to the B-24 Liberator. Like the B-24 it was originally designed with twin fins and a large Davis-type wing, but with a longer, rounder fuselage and a rounded nose. The powerplants were to be four 2,200 horsepower (1,600 kW) Wright R-3350s, the same as specified for B-29s. The aircraft was designed to be pressurized, and have remote controlled retractable gun turrets with fourteen 0.5 in (12.7 mm) machine guns. It was to have an estimated gross weight of 101,000 lb (46,000 kg). The first contract for two XB-32s was signed on 6 September 1940, the same day as the contract for the Boeing prototype XB-29. The first XB-32-CO, AAF s/n 41-141, was constructed next to the Army Air Force (AAF) Base Tarrant Field Airdrome at the AAF Aircraft Plant No. 4 just west of Fort Worth, Texas along the south side of Lake Worth. The Consolidated Vultee Bomber Plant assembly line was six months behind schedule, making its first flight on 7 September 1942. Due to problems with the pressurization system, the gun turrets and landing gear doors, these items were omitted on the first prototype. The aircraft had R-3350-13 engines inboard and R-3350-21s outboard driving three-bladed propellers. The prototype was to have persistent problems with engine oil leaks and poor cooling. The B-29 had similar engine problems. The inboard propellers could be reversed to shorten the landing roll. The first XB-32 was armed with eight 0.5 in (12.7 mm) machine guns in dorsal and ventral turrets, and an odd combination of two .50 caliber and one 20 mm (0.787 in) cannon in each outboard engine nacelle firing rearwards, plus two .50 caliber machine guns in the wings outboard of the propellers. The turrets were remotely controlled from periscopic sights in aiming stations inside the aircraft. The sights were coordinated by a sophisticated analog computer system developed by Sperry Gyroscope Company. On 17 March 1943, the initial contract was signed for 300 B-32-CFs but development problems continued. On 10 May 1943, the first XB-32 crashed on takeoff after making a total of 30 flights before the second XB-32, s/n 41-142, finally flew on 2 July 1943. This aircraft had a traditional stepped cockpit canopy. Upon examination and testing the USAAF recommended a large number of changes that included more conventional gun stations. The pressurization system problems were never solved, and consequently the aircraft was re-purposed as a bomber to be operated at low and medium altitude; however, this decision only meant that it was easily eliminated from production aircraft. Problems with the remote controlled gun turrets were also never solved and the armament on production aircraft was changed to 10 .50 caliber machine guns in manually operated turrets: Sperry A-17 turrets in the nose and tail, two Martin A-3F-A dorsal turrets, and one Sperry A-13-A ball turret. The bomb load was increased by 4,000 pounds (1,800 kg) to 20,000 pounds (9,100 kg). The second XB-32 continued to have stability problems. In an attempt to resolve this a B-29 style tail was fitted to the aircraft after its 25th flight but this did not resolve the problem and a Consolidated-designed 19.5 ft (5.9 m) vertical tail was added and first flown on the third XB-32, s/n 41-18336 on 3 November 1943. The first production aircraft was fitted with a B-29 vertical tail initially before a new tail was eventually substituted. 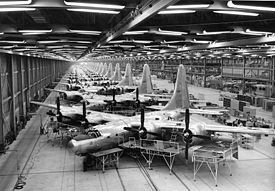 By 1944 testing of the three prototypes permitted the AAF to place orders for over 1,500 B-32s. The first production aircraft was delivered on 19 September 1944, by which time the B-29 was already in combat in China. The first B-32 crashed on the same day it was delivered when the nose wheel collapsed on landing. Beginning on 27 January 1945, 40 B-32A-5, -10 and -15 aircraft were delivered as unarmed TB-32-CF crew trainers. Originally, the Army Air Force intended the B-32 as a "fallback" design to be used only if the B-29 program fell significantly behind in its development schedule. As development of the B-32 became seriously delayed this plan became unnecessary due to the success of the B-29. Initial plans to use the B-32 to supplement the B-29 in re-equipping B-17 and B-24 groups before redeployment of the Eighth and Fifteenth Air Forces to the Pacific were stymied when only five production models had been delivered by the end of 1944, by which time full B-29 operations were underway in the Twentieth Air Force. The first assignment of the B-32 began when General George Kenney the commander of Allied air forces in the South West Pacific Area, and commander of the U.S. Fifth Air Force, traveled to Washington D.C. to request B-29s. 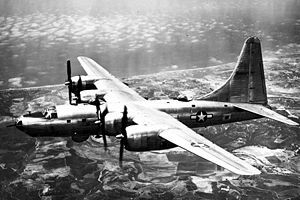 Since priority had been given to strategic bombing by the B-29, Kenney’s request was denied, after which he requested the B-32. Following a demonstration, the Army General Staff agreed that Kenney could conduct a combat evaluation, and a test schedule of eleven missions was set up, followed by a plan to convert two of the 312th Bomb Group's four Douglas A-20 Havoc squadrons to B-32s. Project crews took three B-32s to Clark Field, Luzon, Philippine Islands in mid-May 1945, for a series of test flights completed on 17 June. The test crews were impressed with its unique reversible-pitch inboard propellers and the Davis wing which gave it excellent landing performance. However, they found a number of faults: the cockpit had an extremely high noise level, a poor instrument layout, the bombardier's vision was impaired, it was overweight and the nacelle design resulted in frequent engine fires. The three test B-32s were assigned to the 312th BG's 386th Bomb Squadron. On 29 May 1945, the first of four combat missions by the B-32 was flown against a supply depot at Antatet in the Philippines, followed by two B-32s dropping sixteen 2,000 lb (910 kg) bombs on a sugar mill at Taito, Formosa on the 15th of June. On 22 June, a B-32 bombed an alcohol plant at Heito, Formosa, with 500 lb (230 kg) bombs, but a second B-32 missed flak positions with its 260 lb (120 kg) fragmentation bombs. The last mission was flown on 25 June against bridges near Kiirun in Taiwan. The testing missions were mostly successful, and, in July, the 386th Bomb Squadron completed its transition to the B-32, flying six more combat missions before the war ended. On 13 August, the 386th BS moved from Luzon to Yontan Airfield on Okinawa and flew mostly photographic reconnaissance missions. The missions were intended to monitor Japan's compliance with the cease fire and to gather information such as possible routes occupation forces could take into Tokyo. In addition, Rudolph Pugliese, who was the 386th's assistant intelligence officer, said in 1997 that "the photo-recon missions were also intended to test the fidelity of the Japanese...[adherence] to the terms of the cease-fire." On 17 August, three B-32s in a flight of four were attacked by Japanese flak and fighters. During the two-hour engagement, the Dominators suffered only minor damage and none of their crew were injured. "Though the B-32 gunners later claimed to have damaged one fighter and 'probably destroyed' two others, surviving Japanese records list no losses for that day or next." Based on the Japanese action on the 17th, U.S. commanders felt that it was important to continue the reconnaissance missions over Tokyo so they could determine if it was an isolated incident or an indication that Japan would reject the cease-fire and continue fighting. On 18 August, four Dominators were given the task of photographing many of the targets covered on the previous day; however, mechanical problems caused two to be pulled from the flight. Over Japan, a formation of 14 A6M Zeros and three N1K2-J Shiden-Kai fighters (as is often the case, Shiden-Kai is described as Ki-44 Tojo, but it may be a misunderstanding of the crews) attacked the remaining two U.S. aircraft. Saburo Sakai, a Japanese ace, said later there was concern that the Dominators were attacking. Another Japanese ace, Sadamu Komachi, stated in a 1978 Japanese magazine article that the fighter pilots could not bear to see American bombers flying serenely over a devastated Tokyo. The B-32 Dominator Hobo Queen II (s/n 42-108532) was flying at 20,000 ft (6,100 m) when the Japanese fighters took off and received no significant damage. Hobo Queen II claimed two Zeros destroyed in the action as well as a probable Shiden-Kai. The other Dominator was flying 10,000 ft (3,000 m) below Hobo Queen II when the fighters took off. The fighters heavily damaged that Dominator and seriously wounded two crew members. Photographer Staff Sergeant Joseph Lacharite was wounded in the legs (his recovery required several years). Sergeant Anthony Marchione, a photographer's assistant, helped Lacharite and then was fatally wounded himself. Despite the damage it received, the Dominator was able to return to Okinawa. Marchione was the last American to die in air combat in World War II. On 19 August, propellers were removed from all Japanese fighters as per the terms of the cease fire agreement. The last B-32 combat photo reconnaissance mission was completed on 28 August, during which two B-32s were destroyed in separate accidents, with 15 of the 26 crewmen killed. On 30 August, the 386th Bomb Squadron stood down from operations. Production of the B-32 was cancelled on 8 September 1945, and ceased by 12 October. XB-32 Company Designation Model 33, three built, on first aircraft: Wright R-3350-13 (inboard) and Wright R-3350-21 (outboard) engines, three bladed propeller, rounded, glassed nose, first two aircraft had a twin tail configuration. Second prototype was pressurized and had remotely-controlled retractable gun turrets in the dorsal ventral positions, with a manned tail "stinger." Second and third prototypes had numerous tail variations installed including a B-29 tail installation. First flown 7 September 1942. B-32-1CF Model 34 flight testing aircraft first flown 5 August 1944. Wright R-3350-23 engines. First two aircraft initially had modified B-29 tails installed. Installation of armament, single rudder tabs, radar bombing equipment (AN/APQ-5B and AN/APQ-13) and long range navigation equipment, 10 built. B-32-5CF Twin rudder tabs made standard. Last 11 aircraft converted to TB-32-5CF with deletion of all armament (openings faired over), deletion of radar bombing equipment, and deletion of long range navigation equipment, 15 built. TB-32-10CF Redesigned bombardier's entrance door, replacement of SCR-269-G Radio compass with AN/ARN-7 set, installation of engine fire extinguishers, 25 built. TB-32-15CF Empennage de-icer boots, four built. B-32-20CF Combat equipped aircraft. Pressurization system removed, scanning blister installed in rear fuselage, 21 built. B-32-21CF One B-32-20CF converted to paratroop conversion. All bombing equipment removed and benches installed in rear bomb bay and rear fuselage. B-32-25CF Modified fuel system to allow auxiliary tanks in the bomb bay. AN/APN-9 LORAN, 25 built. B-32-30CF Variant with a stabilized Sperry A-17A nose turret, installation of countermeasure equipment (AN/APQ-2, AN/APT-1 and AN/APT-2) and improved APQ-13A radar bombing equipment. Seven built, last three aircraft flown directly to storage and scrapped. B-32-35CF Seven produced with increased ammunition. Flown directly to storage and scrapped. B-32-45CF/50CF Thirty-Seven under construction. Partially-assembled machines were stripped of all their government-furnished equipment and engines and were scrapped on site by the contractor. B-32-1CO Three aircraft the same as the B-32-20CF but assembled by Consolidated - San Diego. 1 accepted - remaining two flown directly to storage and scrapped. 300 B-32s ordered, 118 delivered, 130 flyable, 170 cancelled, orders for a further 1,099 B-32-CFs and 499 B-32-COs were cancelled after VJ-Day. No examples remain of a B-32. Most production aircraft were delivered incomplete from the factory and flown directly to Davis-Monthan Field, Arizona for storage. Many were offered for sale by the Reconstruction Finance Corporation but no offers were received. A number of B-32 heavy bombers were flown to the Walnut Ridge Army Airfield, in Walnut Ridge, Arkansas, where they were scrapped by the Texas Railway Equipment Company, which bought 4,871 of the various aircraft stored at Walnut Ridge, including fighters and bombers of differing types. Most B-32s were scrapped by 1947. B-32-1-CF, s/n 42-108474 was earmarked for display at the National Museum of the United States Air Force (at the time, the Air Force Museum) at Wright-Patterson Air Force Base, Ohio, but was declared surplus and scrapped at Davis-Monthan in August 1949. One of the only portions of a B-32 surviving is a wing panel removed from a static test model and erected at the Montgomery Memorial near San Diego, California as a monument to aviation pioneer John J. Montgomery. The National Warplane Museum in Horseheads, NY has a B-32 nose turret that was acquired in 1997. A flight jacket belonging to a member of the 386th BS, with a B-32 hand-painted on the back, is on display at the National Museum of the United States Air Force near Dayton, Ohio. Bowman, Martin W. USAAF Handbook 1939-1945. Stroud, Gloucestershire, UK: Sutton Publishing, 2003. ISBN 0-8117-1822-0. Harding, Stephen. "The Last to Die". Air & Space, Volume 23, no. 4, November 2008. Harding, Stephen and James I. Long. Dominator: The Story of the Consolidated B-32 Bomber. Missoula, MT: Pictorial Histories Publishing Company, 1984. ISBN 0-933126-38-7. Sinko, Benjamin A. Echoes of the Dominator: the Tales and the Men who flew the B-32. Blaine, MN: Up North Press, 2007. ISBN 978-0-615-15898-3. Wegg, John. General Dynamic Aircraft and their Predecessors.London: Putnam, 1990. ISBN 0-85177-833-X. Wolf, William. Consolidated B-32 Dominator: The Ultimate Look, from Drawing Board to Scrapyard. Atglen, PA: Schiffer Publishing, 2006. ISBN 0-7643-2451-9.